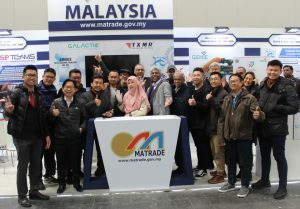 Malaysia External Trade Development Corporation (MATRADE) is Malaysia’s national trade promotion agency and frequently organises Malaysian Pavilions at major trade fairs throughout the world, such as Hannovermesse 2019 (1.-5.4.2019). MATRADE is represented worldwide at 40 locations in major commercial cities. In Europe, MATRADE runs offices in Frankfurt, London, Paris, Milan, The Hague, Istanbul, Budapest, Warsaw, Kiev and Moscow. As a global trading nation, Malaysian business communities are looking forward to being your long-term business and trusted partners. MATRADE as the national trade promotion agency will be your one-stop source in your search for Malaysian products and services providers. Contact us today with your requirements and we shall match you with your ideal business partner in Malaysia. – Delegation and mission organisation and coordination to Europe and Malaysia. For more details visit our website at http://www.matrade.gov.my or contact us: frankfurt@matrade.gov.my.